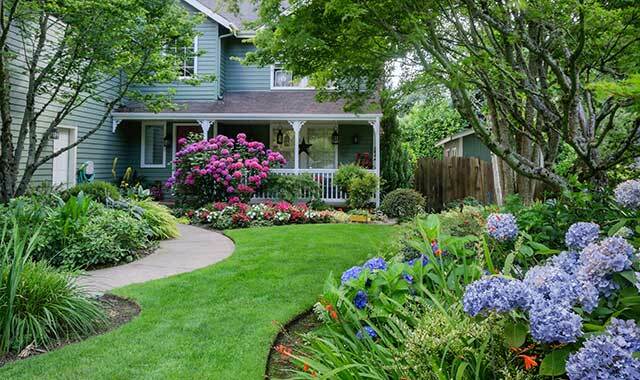 Transforming your curb appeal from ho-hum to stand-out may not be as difficult as you think, when you work with reliable professionals who truly understand plants, products, design principles and your personal tastes. When it comes to improving the outdoor spaces around your home, the possibilities are nearly endless. Even modest improvements can make a big difference to your quality of life. For that reason, ponds are less popular than they once were but pergolas are very much in demand, as are retaining walls, patios, paver walkways, fire pits and relaxation gardens. Crimson Valley also installs outdoor kitchens, fireplaces, swimming pools, patios, irrigation systems and outdoor lighting. Sanders gets many requests for relaxation or healing gardens these days. People like having a peaceful place to meditate or just enjoy their coffee in the morning. Sanders cautions homeowners to be thorough when hiring a landscaping firm. “I think most of the landscapers here in town are good people and want to do a good job. But as a consumer, you do need to be careful. It’s important to get a detailed, written estimate with a guaranteed price for a project. Make sure particulars are spelled out, like the size of a patio and the type of material that will be used. There should be a timeframe stipulated and a written payment schedule. Also, make it clear that you want to be notified in writing of any changes along the way that will drive up the cost. Be patient with the design process and consider starting it well before the spring rush, Sanders recommends. If a job estimate comes in very low and seems too good to be true, it probably is. Make sure the specified materials, sizes and other details are an apples-to-apples comparison with other estimates you receive. Joe Taylor, owner of Changing Seasons Landscaping, in Belvidere, enjoys helping his customers make the most of their properties. His company offers hardscaping, lawn care, seasonal cleanups and landscape design/installation. It’s important to use high-quality plant materials and provide ongoing care, says Taylor. Taylor says any property can be improved with a landscaping plan, whether lavish or modest in scale. Through the years, Taylor has lived by a tried-and-true philosophy: Keep it simple and do it right. Taylor says that making a nicer outdoor space for people adds to their happiness, which makes him feel good. Mark and Debbie Walter, owners of LawnCare by Walter, Cherry Valley, have been improving lawns for more than 30 years. Their services have evolved from fertilization and weed control treatments to total site management. There’s more to cultivating a good lawn than meets the eye, says Mark. The Walters say they compete well on price, but urge potential customers to look beyond the bottom line to overall value. For example, national lawn care chains tend to prescribe more lawn applications than necessary, often up to seven per season. “That may make sense in Florida, but not in our climate,” says Mark. LawnCare by Walter uses granular fertilizer and liquid herbicides hand-picked by Mark. The business offers a deluxe lawn care program that includes six treatments with fertilization, crabgrass control and weed control. Other lawn services include core aeration, preventive grub control, finish grading, slit seeding, over seeding and sod. In addition to experienced lawn care technicians, the landscape team offers the know-how to transform any outdoor space. The Walters believe excellent customer service is what differentiates their business. Admiring a job well done never gets old. This entry was posted on Thursday, June 8th, 2017 at 12:00 pm	and is filed under Home & Garden, Top Posts. You can follow any responses to this entry through the RSS 2.0 feed. Both comments and pings are currently closed.